At Southpointe Dental in Red Deer, we provide wisdom teeth removal. A tooth extraction is a process of removing a tooth from its socket. A tooth may need to be extracted if it has sustained heavy damage or if it has suffered from deep decay. A wisdom tooth that is causing issues may also need to be removed. Wisdom teeth are the last teeth to make their appearance and can be found at the very back of your upper and lower jaw. Wisdom teeth can cause issues when they grow into nearby teeth if there isn’t enough room to accommodate them. Wisdom teeth can also become impacted which occurs when the tooth fails to erupt through the gum line. Both wisdom and impacted wisdom teeth can create painful symptoms, such as inflammation, discomfort, swelling, and damage to surrounding areas. Also, because of their awkward position, it’s difficult to properly brush and floss wisdom teeth, which increases the risks of decay. To avoid these complications, our Red Deer dentists may recommend wisdom tooth removal. To determine if a tooth should be extracted, we will examine your teeth and bone tissue using technology such as digital X-rays. This allows us to get an up close and personal look at your teeth and bone tissues. In the event that a wisdom tooth should be removed, you will be given anesthesia to eliminate discomfort during the procedure. 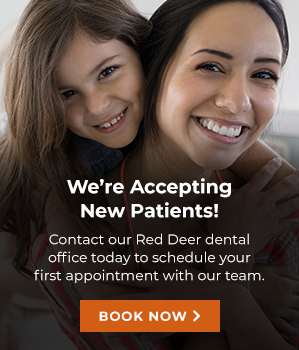 Contact Southpointe Dental in Red Deer if you have any questions about wisdom teeth.